UPDATED: Sat., Sept. 8, 2018, 7:34 p.m.
Daniel Roy tweeted that response to USA Swimming’s announcement, accompanied by a picture of him in action, that the 2018 Gonzaga Prep graduate was selected to the 2018-19 USA Swimming National Team. Roy, a freshman at Stanford, is one of six named in the men’s 200-meter breaststroke. He’s also one of five Cardinal swimmers, the most of any university, and one of 26 first-time members of the U.S. Senior National Team. The announcement last week came a little more than a week after Roy collected four medals, three of them gold, including one for winning the men’s 200 breast, at the Junior Pan Pacific Championships. Roy, captain of Team USA at that event, earned the other golds swimming the breaststroke leg of mixed and men’s 4x100 medley relays. He won silver in the men’s 100 breast. Roy finished sixth in the 200 breaststroke at the 2018 Phillips 66 U.S. Nationals in a time of 2 minutes, 9.76 seconds to earn his spot on the team. But his best time in 2018 was his PR of 2:09.73 in the TYR Pro Swim Series in Indianapolis in mid-May when he set the national age-group record, becoming the first 18-and-under American male to go under 2:10. 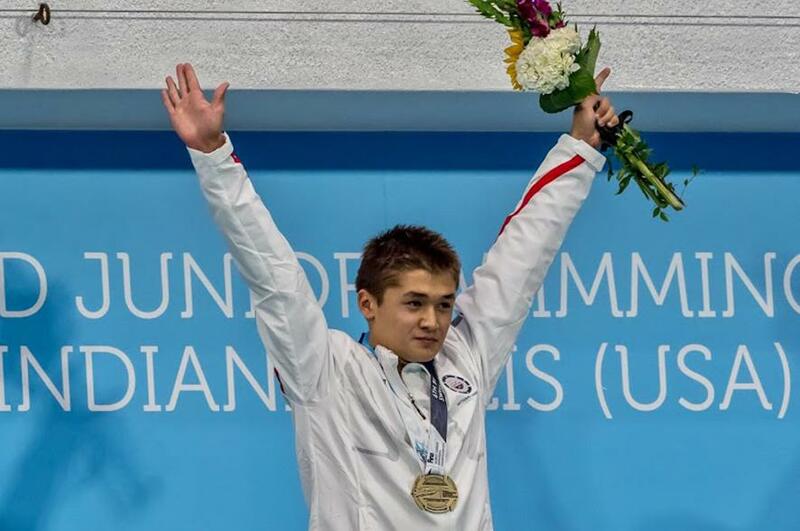 He won the 200 breast at the 2017 Junior World Championships after finishing third in 2016. Two more former Idaho Vandals have signed to play professionally overseas. Arkadiy Mkrtychyan becomes the third Vandal from last year’s senior class to take his game overseas, signing with Pärnu Sadam in Estonia. Earlier in the summer, Brayon Blake signed with Löwen Braunschweig in Germany and Victor Sanders with the Telenet Giants in Antwerp, Belgium. Mkrtychyan, who played for Team Armenia in the FIBA Basketball World Cup 2019 European Pre-Qualifiers, averaged 7.8 points and 4.1 rebounds per game during his four-year career at UI. He appeared in 120 games, the fifth most by a Vandal in team history. Nahshon George, a 2014-16 Vandal, signed with Sporting Alexandria in Egypt for 2018-19 after playing last season with Hang Tuah in Indonesia, where he ranked fifth in the league in both points (23.4) and rebounds (12.9) and made the All-Indonesian IBL first team. Previously, he played with Thai General Equipment in the Thailand Basketball League. Joey Biel continued to put his mark in the Monmouth (Illinois) College football record book last weekend and gained national recognition in the process. The Fighting Scots’ junior kicker from Northwest Christian was named the punter on D3football.com’s first national Team of the Week of the 2018 season after booming a single-game, school-record 14 punts for a school-record 560 yards that included a 77-yarder in a 32-7 loss to No. 18 Wheaton. The 77 yards, which is the second longest in Division III this season, ties for sixth on the school’s all-time list and helped him average 40 yards per kick. Four landed inside the 20-yard line. Biel’s name is more prominent in the kick-scoring section of the Monmouth record book. And he made another entry there, too. The extra point he kicked after the Scots’ lone touchdown was his 19th in a row, added to the 18 with which he finished last season. It’s the second 19-game streak of his career. He also has one of 23 games and another of 18. • Jessica Schmautz, a Whitworth senior from Lakeside of Nine Mile Falls and Community Colleges of Spokane, is the season’s first Northwest Conference Volleyball Offensive Player of the Week after leading the Pirates to a 4-0 start at the Oregon Trail Tournament. The outside hitter averaged 4.0 kills per set, had a .311 hitting percentage and tied for the team lead in service aces and also was named to the all-tournament team. • Jonny Handel of Lewis-Clark State, a senior from Moscow, Idaho, was named Frontier Conference Men’s Cross Country Runner of the Week. He was the top non-NCAA finisher at the Clash of the Inland Northwest in Moscow, finishing 35th out of 89 runners. His time of 18 minutes, 17 seconds for 6K was one of the fastest in school history for the distance. • Seven Gonzaga Bulldogs who played in summer baseball leagues were selected to all-star teams. West Coast League: Nick Nyquist (Coeur d’Alene High School), Walla Walla Sweets; Taylor Davis and Ernie Yake, Bellingham Bells; and Mason Marenco, Wenatchee Applesox. Alaska Baseball League: Austin Pinorini, Mat-Su Miners (Palmer, Alaska); and Jace Van De Brake, Anchorage Bucs. California Collegiate League: Slade Heggen, Santa Barbara Foresters. Three local seniors combined to run/walk 453 miles in a four-day period during Labor Day weekend in the A Race for the Ages ultra event in Manchester, Tennessee. Gunhild Swanson, 74, of Spokane Valley, finished 10th out of 173 finishers and second among 72 females, accumulating 163 miles in 73 hours, 43 minutes, 3 seconds. Sylvia Quinn, 81, of Spokane, the oldest female in the event, was 18th overall, fifth among females, totaling 150 miles in 80:04:35, and Mary Ann Clute, 65, Spokane, got in 140 miles in 61:25:13 for 23rd overall and sixth among females. Competitors circled a one-mile loop in a park in 96-degree daytime heat – “and 96-percent humidity,” said Quinn. They started at variable times in the around-the-clock event based on their age and could cover as much distance as their legs and stamina would allow in a time based on their age. Lisa Waite, a 1993 Washington State graduate who has worked the past 22 years in the National Basketball Association, has been named associate athletic director for emerging media/creative services at her alma mater, Cougars athletic director Pat Chun announced. She will be responsible for the oversight of the Cougars’ brand development, as well as coordinating efforts for the athletic department’s social media, video and creative efforts. Waite worked for the Seattle Sonics/Oklahoma City Thunder franchise, leading an in-house design team responsible for marketing the team regionally and nationally through all forms of visual communications. Published: Sept. 8, 2018, 3:43 p.m. Updated: Sept. 8, 2018, 7:34 p.m.